Solicitor and secretary to the London Board of Deputies; born in 1804; died in London Nov. 10, 1868. He began life on the Stock Exchange, but after some time resigned his membership and entered the legal profession. He became honorary solicitor to several of the leading charities; as solicitor and secretary to the Board of Deputies his advice was sought on many important issues, and he accompanied Sir Moses Montefiore on his mission to Morocco. 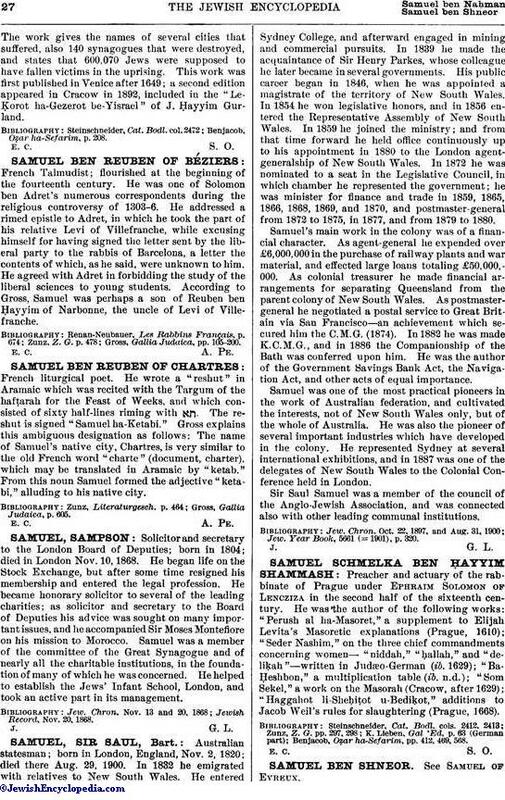 Samuel was a member of the committee of the Great Synagogue and of nearly all the charitable institutions, in the foundation of many of which he was concerned. He helped to establish the Jews' Infant School, London, and took an active part in its management. Jewish Record, Nov. 20, 1868.